Feel the adrenalin and the tension of theMonster Energy Supercross Championship 2017with MONSTER ENERGY SUPERCROSS – THE OFFICIAL VIDEOGAME! Rase with theofficial driversfrom the 250SX and the 450SX viaofficial routes, including Daytona, and experience one of the most spectacular and entertaining racing competitions ever! Discover thetrack editorWith endless gameplay options, choose your stadium, create your own track and share it online with your friends. Passyour rider and your motorcycle with several possibilities individuallyan, There are more than 80 official brands and 300 items available to help you make it to the top of the leader board! Drive alone or in different waysOffline and online game modesagainst other players from all over the world! 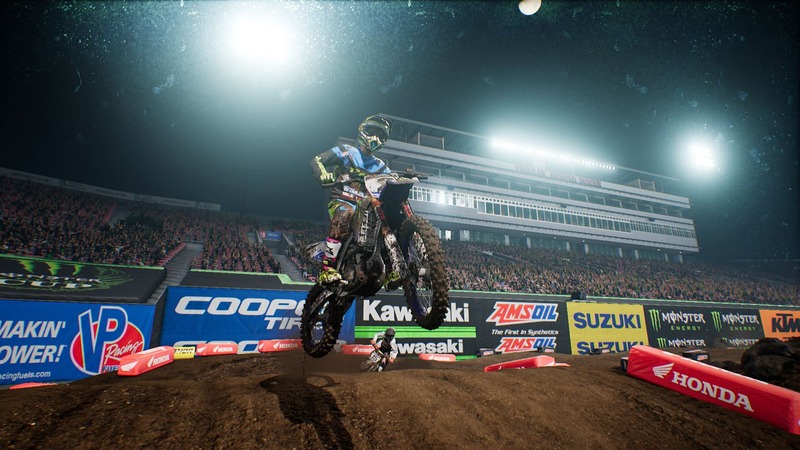 Feel the adrenaline rush, enter the arena and become the supercross king! The officialMonster Energy Supercross 2017Season. Official motorcycles, iconic routes,like the legendary Daytona, and athletes from the 250SX and 450SX class. Einterrific route editorwhich offers you endless gameplay possibilities: create and customize your own tracks and share them online. An exciting onecareer modeWithextreme customization optionsfor drivers and motorcycles. First-class graphicsfor a unique gaming experience and unprecedented gaming experience with accurate replicas of motorcycles, tracks, accessories and athletes.